A British band whose career was launched while based in Germany, Nektar released 7 studio albums between 1971-1977, the first 6 of which included the “classic” lineup of Roye Albrighton on guitar and vocals, Allan “Taff” Freeman on keyboards, Derek “Mo” Moore on bass, and Ron Howden on drums. I love these albums, which can vary considerably from one to the next, while retaining a distinct Nektar flavor, and are among the 70s albums I revisit most often. The band would pop up again in the early 80s and have been active again since around 2000, though the 70s albums are, in my opinion, the true classics. 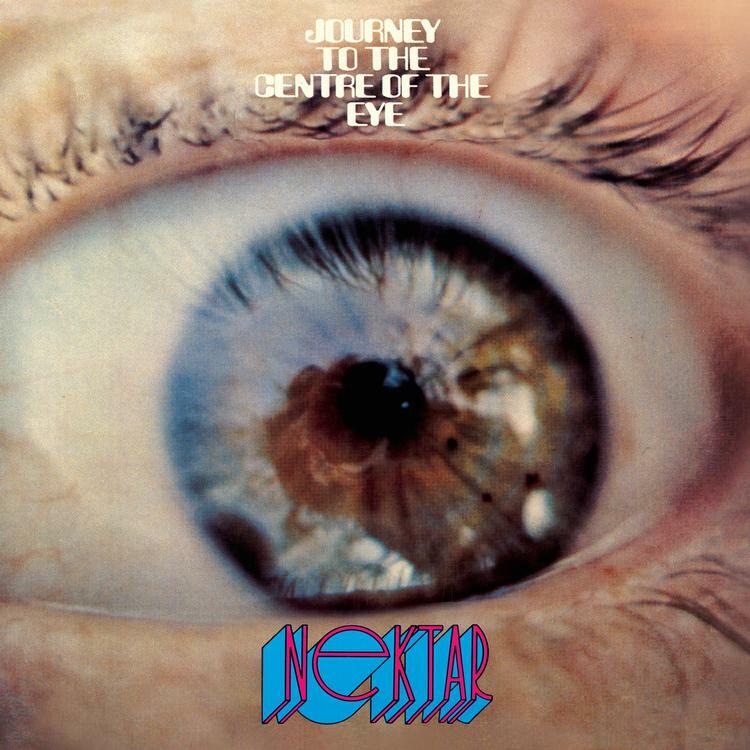 Cleopatra Records’ Purple Pyramid subdivision has reissued the first Nektar album – Journey To The Centre Of The Eye – in a 2-CD edition that features the original album remastered, and a 1971 live performance of the entire album. Journey To The Centre Of The Eye is an early example of Space Rock and Prog-Psych that tells the story of an astronaut leaving Earth in a rocket when the planet is on the verge of nuclear world war. Aliens are encountered, new galaxies are discovered, and, ultimately, mind expansion and a new awareness just as the astronaut witnesses the destruction of Earth. Each track on the back of the LP (which I still have) has notes that tell each bit of the story, though they are extremely difficult for these old eyes to read as shrunk down as they are to fit on the back of the CD. In the CD notes, Dave Thompson writes that the album “earned comparison with everyone from Man to Pink Floyd”, and it baffles me that Hawkwind isn’t mentioned. The guitar and effects on various parts of the album are similar to the freakiest moments from Hawkwind’s early albums. Remember, this is 1971. The experimentalism of early Pink Floyd is also a good analogy, as evidenced on tracks like Warp Oversight, which is like Astronomy Domine and Set The Controls For The Heart Of The Sun wrapped into one. As the tale starts to unfold we get the trademark Nektar guitar/organ interplay and we’re in classic era prog-psych heaven. Moments of high intensity weave in and out with passages of sheer dream-like beauty. Nektar excel on this album at both thematic development and creating a mind-expanding listening experience. In short, putting this into 1971 perspective, attentive listeners could marvel at the band’s flair for wrapping prog infused hard rock, psychedelia and alien effects into an impressively complex and seamlessly flowing sci-fi tale, and those who just wanted music they could trip out to would have one of the best albums of the year to meet that need. And while in terms of the music this first album is the most overtly space rock, Nektar would explore similar themes on subsequent albums, Remember The Future being the best example. The bonus CD features the entire album performed live on November 13, 1971 in Darmstadt, Germany. It’s called an “official bootleg”, and while the sound quality justifies the bootleg tag, it’s pretty decent and well worth the opportunity to hear the band live so early in their career. In summary, Journey To The Centre Of The Eye is essential for both space rock fans anyone into 70s prog-psych.